Caltrain ridership has increased at a faster rate than that of any other Bay Area transit agency over the past decade. The Caltrain Modernization Program will electrify and upgrade the Caltrain's commuter rail service between San Jose and San Francisco. 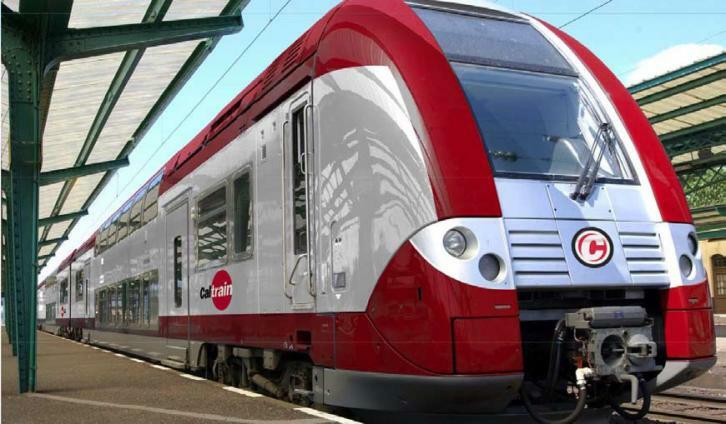 Rendering of new Caltrain Electrical Multiple Unit (EMU). The $1.7 billion program includes installation of an advanced signal system known as Positive Train Control, which is required by the federal government. Visit the Caltrain website: Get current news and more details about the Caltrain Modernization Program. Electrified trains operated by both Caltrain and the California High-Speed Rail Authority will share existing tracks in the Caltrain corridor between San Jose and San Francisco. This “blended system” will reduce costs, speed implementation, and limit impacts on adjacent neighborhoods.